The other day one of our son’s and his family stopped by for a visit and it was a nice quiet time. Two of the three grandchildren came with our son and his wife for dinner. My Bride is her typical style was all excited and she planned a little dinner for the group and it was a small enough affair that we could make it more intimate and we sat in the breakfast room. It was not a fancy, but she still put out some cheese and crackers along with some charcuterie to nibble on while dinner was being prepared. The adults were in the kitchen and the two children were of course deep in trance with their electronic gadgets, such is life in modern times. My Bride went big and of course made too much food, but it worked out anyways. She did a quick marinade on a whole tenderloin and while that was cooking, she made mashed potatoes, mixed vegetables and spinach. She is a firm believer of having vegetables and starch along with the meat for a balance diet; and of course there is a salad as well. After dinner we had a cherry pie and ice cream, of course I would venture to say that cherry pie is the State Dessert of Michigan or it should be, of course there have been an ample amount of cherry orchards that have been replaced with vineyard, but there is no complaints from me. 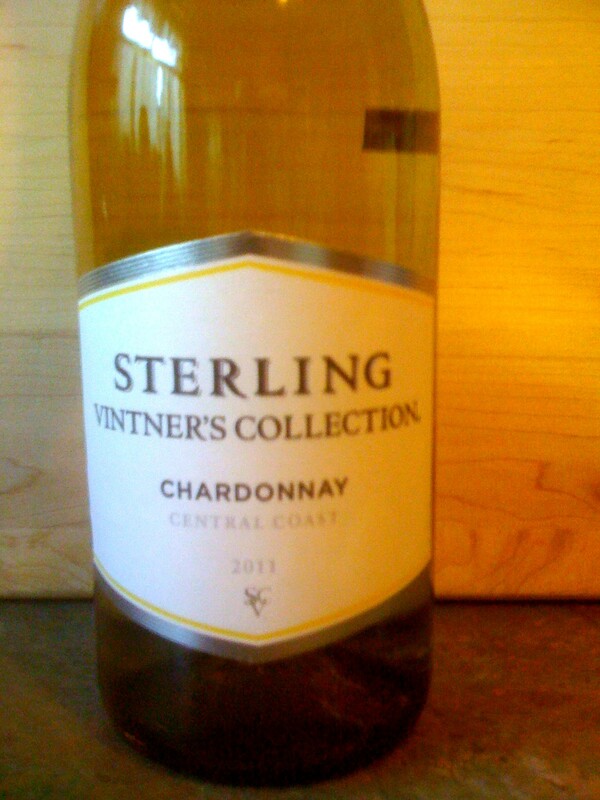 We started of with a bottle of Sterling Vintner’s Collection Chardonnay 2011 which was in the refrigerator. This is a fine every day Chardonnay from the Central Coast of California and we always have a couple of cases of Chardonnay on hand, and always at least one bottle being chilled. This time of the year with the days finally getting warmer, a chilled glass of wine is a great way to start the dinner off properly. I selected a different wine for the tenderloin that I thought would be interesting from Spain. 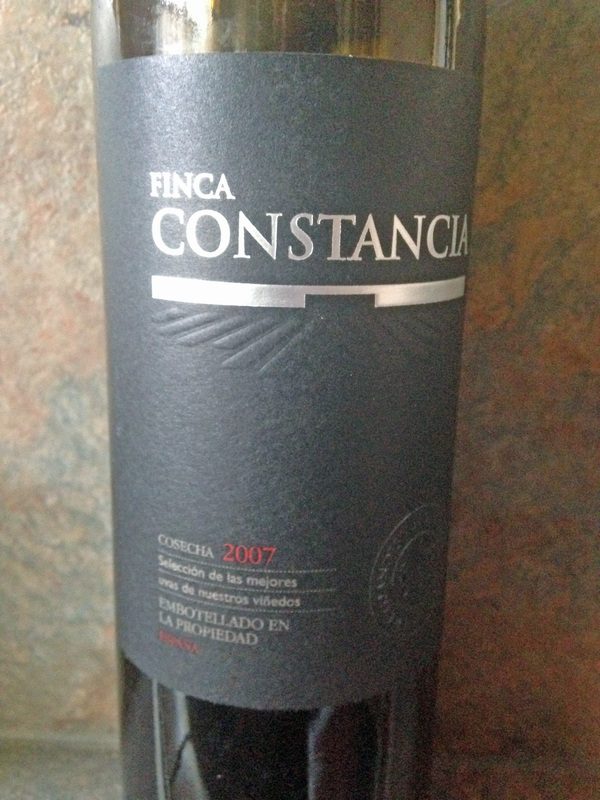 We opened up a bottle of Gonzales Byass Finca Constancia VdlT Castilla 2007. VdlT means Vino de la Tierra and this was from Castilla La Mancha and this area includes Europe’s largest delimited wine zone La Mancha, the wine carries the VdlT designation because it allows the wineries some leeway, by allowing them to use varietals that are not indigenous to the region. This particular wine was a blend of Cabernet Sauvignon, Syrah, Tempranillo, Petit Verdot, Graciano and Cabernet Franc. This wine is from a relatively new vineyard and the fruit is hand picked and aged from six to twelve months in a mix of American and French Oak barrels. It was very enjoyable and even with the mixture of grapes; it had a definite Spanish flavor to the wine as compared to Claret. The Castilla La Mancha region has a very long growing season, so the fruit normally matures to its fullest by harvest and I did not think that it was fruit forward, as so many wines seem to be these days. Of course our guests seemed to leave much too soon, especially for my Bride, but it was a most pleasant day. This entry was posted in Dining, Wine and tagged Cabernet Franc, Cabernet Sauvignon, California, Central Coast, Chardonnay, Finca Constancia, Gonzales Byass, Graciano, Petit Verdot, Spain, Sterling Vintner's Collection, Syrah, Tempranillo, Vino de la Tierra de Castilla. Bookmark the permalink.